Official artwork of Mr. Resetti from Animal Crossing: New Leaf. Mr. Resetti (リセットさん, Reset-san) is a character from the Animal Crossing series. Mr. Resetti lecturing the player in Animal Crossing: City Folk. In all four Animal Crossing games, Mr. Resetti appears whenever the player walks out their house after resetting the system or turning the power off without saving. Mr. Resetti then proceeds to bother the player by giving a long lecture on how "resetting" the game is bad. 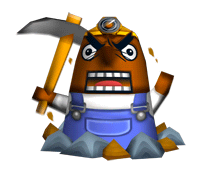 The player usually has to apologize to Mr. Resetti in order for him to leave. 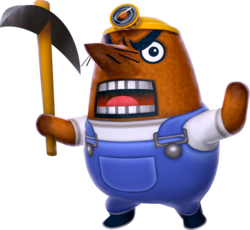 Sometimes though, apologizing isn't enough for Mr. Resetti: he keeps shouting, and sometimes make the player repeat a phrase that is meant to humiliate them (such as "I'm dirt"). He also sometimes gives a code that he says and the player must type it correctly. Mr. Resetti only appears as a trophy. Mr. Resetti trophy in Melee. Prepare to receive a really long talking-to if you reset this game: the next time you play, Mr. Resetti will be waiting to deliver his best scolding. No matter what your intentions are, pressing the RESET Button will bring you face-to-face with this fervent character. Sometimes the only way to shut him up is to apologize. 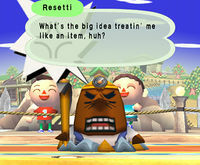 Because Animal Crossing had not yet been released outside of Japan at the time of Melee's release, Mr. Resetti's first appearance is listed on his trophy as "Future Release". Mr. Resetti makes an appearance in Super Smash Bros. Brawl as an Assist Trophy, where he simply sits where he was released and lectures the players with long monologues that can last for over a minute before leaving with his signature "SCRAM!". His large text boxes obscure a large section of the upper playing field, which can be distracting to fighters, or the lower area of the screen (depending on his position), obscuring the damage percentages. He will respond to certain events, such as him falling off the playing field on a moving stage, where he will say, "H-hey! Don't you ditch me punk!". It's possible to interact with him by attacking him, but doing so only adds to his complaining. If a player attacks Mr. Resetti enough, he will respond with an explosion, while asking the attacker to "QUIET DOWN, WILL YA!". This explosion can harm players. He will also block projectiles that are thrown at him. Depending on the time of day, Mr. Resetti may make a comment (for example, at night, Mr. Resetti tells players to "Get some shut-eye", adding that "Staying up late is for punks"). He will also do impressions of characters on the field (calling them by their player name if those are being used, and usually their win screen taunt). Mr. Resetti's text box will be visible regardless of the camera position, and even show up on Snapshots. Mr. Resetti trophy in Brawl. Mr. Resetti (feet) trophy in Brawl. Mr. Resetti saying "Resetti" in a hacked one-player match. 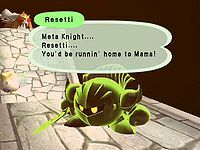 By entering a match with only one player by means of hacking and getting Resetti out of an Assist Trophy, Mr. Resetti is forced to say his own name instead of the nonexistent second player's name, in the sentence "[Player 1].... [Player 2].... You'd be runnin' home to Mama!". The glitched message will appear as "[Player 1].... Resetti.... You'd be runnin' home to Mama!". Presumably, the game is programmed to display "Resetti" if there is any sort of error getting the intended target's name, using his as placeholder. While Mr. Resetti is not an assist trophy anymore, he makes a background appearance in the Town and City stage. Mr. Resetti appears as a red trophy item: when used he resets chosen opponent's stats to zero for the upcoming battle only. Mr. Resetti's trophy in Super Smash Bros. for Nintendo 3DS. Mr. Resetti's trophy in Super Smash Bros. for Wii U. Forget to save your game before stopping for the day? "GRRAAAAH!" You're going to hear from Mr. Resetti! He and his brother, Don, keep an eye out for reckless resetting and give you a, er...gentle reminder not to. Tempted to "forget" so you can meet them again? Don't. Just don't. Interestingly, Resetti is one of only three Assist Trophies in the game whose actual trophy is different from his artwork on the Smash Bros. DOJO!!. Dr. Wright and Lyn are the others. When Mr. Resetti is on stage, Smash Balls will not appear.